Aim. 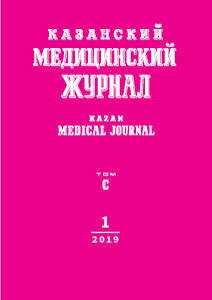 To establish the role of genus Candida in etiology of nosocomial infections in a multidisciplinary surgical clinic of Azerbaijan Medical University in 2014-2016. Methods. Microbiological study was performed on the pathological material from 41 patients with nosocomial pneumonia, 40 patients with surgical site infections and 46 patients with nosocomial sepsis. Results. Nosocomial infections developing in a multidisciplinary surgical clinic were found to depend on localization of nosocomial infections. In nosocomial pneumonia 24% of all isolated microorgamisms were fungi of genus Candida among which C. albicans was prevailing: 9 of 12 isolated strains of Candida (75%) were identified as C. albicans. In patients with surgical site infections 10.7% of all isolated microorganisms were fungi of the genus Candida among which C. albicans was also prevailing: 4 of 6 isolated strains of Candida (66.7%) were identified as C. albicans. The isolated strains of Candida were sensitive to the studied antifungal medicines (amphotericin B, fluconazole, voriconazole, ketokonazole, nystatin). Conclusion. In nosocomial infection and surgical site infections Candida fungi constituted 10.7-24% of all microorganisms isolated from the patients; the isolated Candida fungi - causative agents of nosocomial infections - were not resistant to antifungal medicines (amphotericin B, fluconazole, voriconazole, ketokonazole, nystatin). nosocomial infections, microorganisms, fungi of genus Candida, sensitivity to antifungal medicines. Vincent J.L., Rello J., Marshall J. et al. International study of the prevalence and outcomes of infection in intensive care units. JAMA. 2009; 302 (21): 2323. doi: 10.1001/jama.2009.1754. Durando P., Bassetti M., Orengo G. et al. Hospital-acquired infections and leading pathogens detected in a regional university adult acute-care hospital in Genoa, Liguria, Italy: results from a prevalence study. J. Prev. Med. Hyg. 2010; 51 (2): 80–86. PMID: 21155410. Jones R.N. Microbial etiologies of hospital-acquired bacterial pneumonia and ventilator-associated bacterial pneumonia. Clin. Infect. Dis. 2010; 51 (9): 1114. doi: 10.1086/653053. Stevens R.M. Pneumonia in an intensive care unit. A 30-month experience. Arch. Intern. Med. 1974; 134: ­106–111. doi: 10.1001/archinte.1974.00320190108015. Shahane V., Bhawal S., Lele U. Surgical site infections: A one year prospective study in a tertiary care center. Int. J. Health Sci. 2012; 6 (1): 79–84. doi: 10.12816/0005976. Li J., Yu L., Yang J. et al. Species distribution of pathogens and prognostic factors for catheter-related blood­stream infections in intensive care unit. Zhonghua. Yi. Xue. Za. Zhi. 2015; 95 (9): 659–662. PMID: 25976045. Kang J., Sickbert-Bennett E.E., Brown V.M. et al. Relative frequency of health care-associated pathogens by infection site at a university hospital from 1980 to 2008. Am. J. Infect. Control. 2012; 40 (5): 416–420. doi: 10.1016/j.ajic.2011.06.013. Jia L., Yu H., Lu J. et al. Epidemiological charac­teristics and risk factors for patients with catheter-related bloodstream infections in intensive care unit. Zhonghua. Yi. Xue. Za. Zhi. 2015; 95 (9): 654–658. PMID: 25976044. Attman E., Aittoniemi J., Sinisalo M. et al. Etiology, clinical course and outcome of healthcare-associated bloodstream infections in patients with hematological malignancies: a retrospective study of 350 patients in a Finnish tertiary care hospital. Leuk. Lymphoma. 2015; 56 (12): 3370–3377. doi: 10.3109/10428194.2015.1032967.